Beverage Koozie - keep your hands as warm as your heart. No longer use a paper beverage sleeve to keep your hands from being burned by hot coffee or tea. This one is cute and you can use it over and over. Reversible and washable in cold water making it an ecofriendly product. We are supporting the Georgia English Bulldog Rescue (GEBR) group. 25% of sales on these products will go directly to them. You can buy them online or visit the Events page and that will tell you where you can pick one up in person. How are you organizing your extra bags? 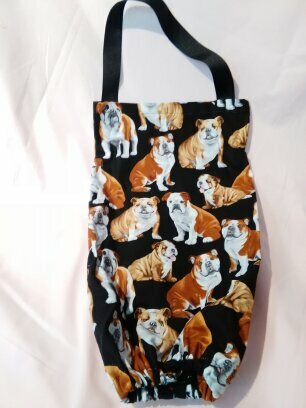 This Bulldog bag will hold at least 25 plastic shopping bags and will look so nice in your house. If you have #bullylove and are a #bulldog lover seeing these cute faces will brighten your day.